It was May 16, 2015, and the Penticton Vees were facing Carleton Place in the semifinals at the National Junior A Championship RBC Cup in Portage la Prairie. The Vees had lost the first game in the round robin and then won three straight, including a win against Carleton. The stakes were high, the players were exhausted and the game went into double overtime. 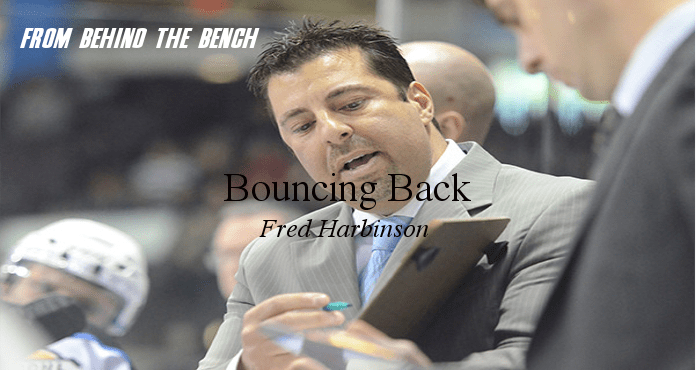 In the first in a new series of Essays from the Bench (or whatever), The Coaches Site caught up with Penticton Vees Head Coach, Fred Harbinson, to get his take on resiliency, disappointment, and how to turn hard losses into championships. Here’s what he had to say. “It was a long haul to get there—this was our 32nd playoff game and 90th game total, not counting exhibitions. The way it’s set up now being the Western Canadian Championship, we’d come from playing in a five-team tournament in Fort McMurray before Portage la Prairie, so we had spent 21 of our last 30 days in hotels. To put it in context with the NHL where you have four rounds of playoffs, if each series goes seven games, you play 28 games. So to think that we were playing our 32nd playoff game was kind of crazy. We were exhausted; it was a battle of attrition. Our guys were fighting to stay alive. Talk about resilience. We were a team that kept finding ways to bounce back. In the first round of the playoffs, we lost game one at home and then we were down 2-0 going into the third. Then we rallied and won in overtime and went on to win in five. In the next series, we were down three games to two against Vernon and went into their building in game six and won, then came back and won in game seven. And then in the league final, we lost both home games and found ourselves down two games to nothing, then won four games straight, three in Nanaimo’s building. So we kept finding ways. Our opponents had a lot of motivation to get back to the finals. They had been in the national championship game a year earlier and had blown a game where they were up by two goals with a couple minutes to go and ended up losing in overtime. And for us, we won the national championship in ’12, so there were a lot of good storylines. We started the semifinal game pretty well. By the mid point, we got the lead and it was 1-0. We had plenty of chances to make it 2-0, but they tied it up near the end of the second period. The third period stayed the same so it set the stage for overtime. In the first OT, both teams had some opportunities and I think it was a bit of a feeling out process—nobody wanted to make any big mistakes. We always build our guys to want to make plays and push forward and I think with the magnitude of the situation, both teams seemed to be sitting back on their heels. And then right around the halfway point of the first OT, we created a turnover in the neutral zone and one of our players ended up firing what seemed like a harmless wrist shot. The puck basically went through the goalie’s armpit and got caught up, then dropped behind him and started rolling. At that point, the referee arbitrarily blew his whistle and killed the play, and the puck rolled over the line. It was just one of those unfortunate things. Half our team had jumped up off the bench, thinking we were going to the final, and we had to re-set and find a way to put it behind us; we don’t have video review and there’s no time to just sit there. We made it through the rest of that overtime and went into the next. We tried to make a play to clear the zone and they knocked it down and made a really good play from the left boards to the slot and one of their guys shoots the puck. Our goalie made the save but the rebound was right there for one of their guys to bang it in. People can probably attest that when you get bad news, you usually don’t hear what’s next, it all just kind of goes silent. For me, it was a tough pill to swallow at the time—all the work you put in recruiting, assembling the team, all the games, the practices, to get that close is a real kick to the gut, especially with the thought that we had actually won the game the previous period. After the game, I told the guys I was really proud of them. There aren’t many teams that could come back the way we did, that many times. We have this reputation of being a highly offensive, skill-type team. To be honest, last year, it wasn’t that we didn’t have skill but we were’t an offensive team, our leading scorer had 47 points. To put it in perspective, right now with seven games to go in our season, we have seven guys that have more points than that and our leading scorer has more than 100! So we did it by working hard, when other teams didn’t want to keep skating, we kept going. Our program is built on winning and teaching guys to play the right way and do the right things. The players had left everything on the ice and they’d done everything that was asked of them all year long, and then you have a situation like that that was out of their control. It’s one thing to climb the mountain but when someone kicks you off the mountain just when you’re about to get to the top, it’s hard. But I was really proud of what they did and what they had accomplished, so I told them that, and I told them that I thought a lot of them were going to go on. I always try to instil in the guys—it’s part of our culture here—that it means something to leave here with your head held high and know that you’ve left the program in a better place than when you got here. That group last year definitely has done that and it’s helped us going into this season. After the dust settled a couple days later and we were back in Penticton, I had the chance to explain to the guys that unfortunately, they were going to have bigger setbacks and bigger things to deal with in their lives than losing a hockey game. But the lesson is in seeing the hard work they put in and still not getting the ultimate prize can be fuel for future greatness. The experience probably made all those guys better players. We only have four returning players this year but they have made it abundantly clear to the new guys what it felt like to get so close and not get it done. I think that’s driven us to where we are today—we just clinched first overall on Saturday night and we’ve got seven games to go to embark on another chapter and another run to ultimately get the top prize. For me as a coach, it was one of those moments. It was my eighth year here and I’d had a lot of opportunities to leave but it was the first time I said, “Do I still want to be doing this?” That only lasted a couple hours, then I got to work. I didn’t look at the goal that didn’t count, I looked at the other opportunities in the game where we could have been better. Like I mentioned, last year we didn’t score enough to spread games open and we struggled on the power play—we had two power plays in overtime that game that we didn’t score on. So I demanded it of myself to make sure we added some more talent up front so that we can score. Now, our power play leads the league this year with a little over 30 per cent. It made me a better coach. We get everybody’s A+ game against us, and I think our program has always had the attitude that no matter what the circumstances are, we come to work and try to find ways to navigate through the game and through the day to be champions and to be winners.